With the 2014 FIBA Basketball World Cup getting to the knockout stages, the games where many fans tune in for drama, it is easy to see that the NBA isn’t getting a great deal of focus at the moment. The thing is though; this is just fine for many in the backroom at NBA teams, because it allows them to carry out their business. There are still some player trades to sort out but there is also a lot to think about with respect to finances. When there is so much money at stake, it is crucial that the moneymen and women are focused on their job, and this is definitely the case in Phoenix. It looks as though the officials have got a lot of work to do and this is all down to the fact that US Airways have announced they will not be renewing the multi-million dollar naming rights they hold on the team arena. Well, it was American Airlines who stated this, and as the two firms merged last year, this decision was made. Rather prudently, American Airlines felt that there was no need to have three separate arenas in the NBA affiliated with the firm, so they are looking to get out of the contract. The Suns are the operators of the sports and entertainment venue, located in the downtown part of Phoenix and they actually have until October 2015 to fully replace the company. However, there is a break option this year and you get the feeling it could be better for the Suns to find a new sponsor this year. Of course, you don’t want to sign just any agreement. Back in 2005, the club signed a 10 year sponsorship deal with US Airways, which was worth over $20m. There seems to be a level of confidence about finding a good deal because many experts think that corporate firms are spending big on getting back into sports marketing and sponsorship these days. This was borne out by the $40m deals that were agreed by the New Orleans Pelicans and the Portland Trail Blazers. Okay, NFL teams get considerably more money but this is still not a bad deal for renaming your stadium. You know fine well that die-hard fans and people with don’t take to change will make reference to the old names anyway, so it would be interesting to break down the amount of value that a company actually gets from sports sponsorship of this nature. You look at this facility. You look at its reputation. The traffic counts. Its location. The fact that every plane that flies into Sky Harbor looks down into the building as it comes in. It’s something that will bring a new corporate partner some real value. We’re excited to go out there and look. 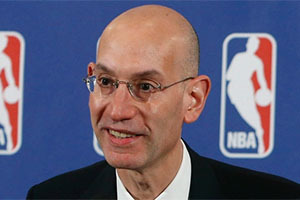 It seems as though money and new deals are on the mind of many people in the NBA, including Commissioner Adams Silver. In an interview, Silver raised the possibility of scheduling basketball matches to coincide with the prime time TV viewing slot in China if the demand for basketball continues to rise in that country. The league and teams need to do everything they can to maximise income but would local fans be too happy about a game having a 10am local tip-off time just to suit the needs of watching viewers halfway around the world. This may help TV viewers but it could kill the audiences at games. At the moment, this is an idea that is very much under wraps at the moment but the fact that such a premium figure in the NBA has spoken about it publically means it may not be a million miles away.